I'll be teaching my Micro Macrame Wrap Bracelet class and my Falling Leaves Bracelet class in Denver at the Rocky Mountain Bead Society's Bead Bazaar. This year marks the 25th anniversary of this event and I'm thrilled to be a part of it. If you've never been before and you have the opportunity, go! They have an impressive array of vendors (makes my heart beat a little faster just thinking about all that loot) and classes ranging from bead weaving and bead embroidery to metal work and micro macrame. Examples of the Wrap (on the left) and Falling Leaves (right) are shown below and class registration is open now (info here). I'll also be teaching in Omaha and their Bead Affair in April. The class selection in Omaha is exciting - they have a couple of beginners' lampwork classes that I'd love to take, along with enameling and fold forming and more. I'll be teaching my Braids Micro Macrame Bracelet class. 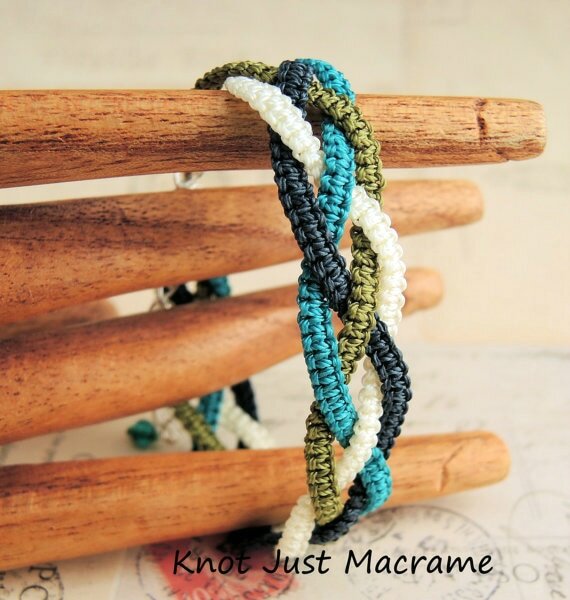 It's suitable for beginners and works up pretty quickly (well, in micro macrame terms anyway) but also includes ending the piece with a split ring and clasp which I think really elevates macrame from the tie and slide closures. Registration for the Omaha classes is also open and you can find all the information here. If neither of those work for you, I'll also be teaching in Kansas City at their Bead Blast. They've scheduled the Micro Macrame Wrap Bracelet, Gypsy Earrings (on the left below) and Leaves Micro Macrame Bracelet (on the right below). Registration just opened for the classes and information is available here. It's an exciting time for me and I hope to get a chance to meet lots of you. Even if you aren't taking one of my classes, if you're at one of these shows, I'll expect you to look me up and introduce yourself. Hint: I'll be the one looking happy to be retired and thrilled to be there! Oh, and if you have suggestions for other places you'd like to see me teach, message me and we'll see what we can work out! Hope to see you soon!